A game deeply rooted in Celtic history and lore. It took me a couple of plays to realise what is so different about Inis (pronounced Inish). While it looks like an area control ‘dudes on a map’ game, with its miniatures and interlocking territory tiles, it’s actually a very clever card game with DOAM trimmings. Winning is all about the careful use of a limited number of Action cards, because you can’t do anything in this game without playing a card. And it’s quite ingenious. 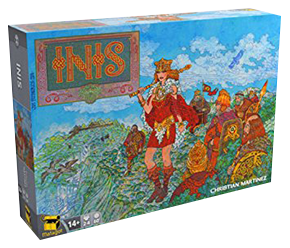 Thinky without being too brain-burning, Inis challenges you to approach winning in far more clever ways than the usual conflict and conquer. In a way it’s the spiritual opposite of its Matagot stablemates, Cyclades and Kemet. In fact, when you enter a ‘clash’ with another player’s clans, you’re encouraged to discuss the situation with your opponent and agree not to fight – a mindset that’s a little tricky to get into, at first. I can see many games of this in the future and all kinds of interesting outcomes. I’m not a big fan of the illustrator Jim Fitzpatrick’s brightly coloured style – though I think better graphic design could have done it more justice – and visually I think it’s a bit of a mish-mash (though many others disagree). But the game is a fascinating exploration of the line between board game and card game and well worth adding to your collection.